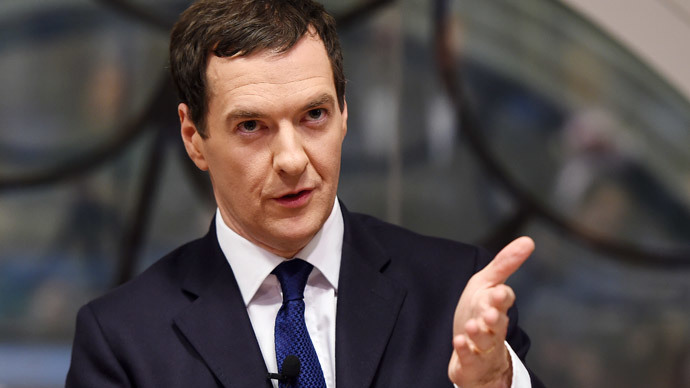 George Osborne advised the public on how to avoid inheritance tax in 2003, a BBC2 video reveals. Amid criticism over the government’s failure to prosecute tax evaders embroiled in the HSBC scandal, the footage will prove embarrassing for the Tories. Downing Street has also come under fire for its appointment of ex-HSBC chief, Stephen Green, as Conservative trade minister in 2011. Green’s tenure began shortly after the British government received leaked files, which indicated HSBC’s Swiss subsidiary was aiding and abetting industrial scale tax avoidance. Stephen Green knew about massive HSBC/HFC fraud because I wrote and told him about it. Since the HSBC scandal broke, the Conservative Party has attempted to highlight the tax arrangements of various Labour Party figures, including party donors and the party’s leader Ed Miliband. On the other hand, the coalition’s failure to adequately investigate HSBC clients involved in tax evasion has been a focal point of criticism by Labour. As Labour continues to condemn Chancellor Osborne for avoiding pertinent questions regarding the HSBC scandal, footage of him promoting the use of “clever financial products” to curb inheritance tax bills will prove controversial. The video, dug up by the Huffington Post, shows the Chancellor offering financial advice to a viewer named Bill in 2003. Osborne was then a backbench Tory MP. “There are some pretty clever financial products that enable you in effect to pass on your home, or the value of your home, to your son or daughter and then get personal care paid for by the state,” Osborne said. As Chancellor of the Exchequer, Osborne has taken a hard line against tax dodging in recent years, stressing aggressive tax avoidance is immoral. Richard Murphy, a global tax expert at UK campaign group the Tax Justice Network, condemned Osborne’s 2003 proposal. Murphy said Osborne was referencing specially devised schemes that entail the transfer of wealth from parents to their children through financial vehicles such as trusts. The tax expert stressed the motive of these schemes was to dump care costs on tax payers, and minimize inheritance tax liabilities. The video, which forms a segment of BBC2’s Daily Politics show, will likely increase pressure on Osborne to openly condemn aggressive tax avoidance yet again. The footage has surfaced at a time when the Labour Party is warning the government’s failure to investigate and prosecute tax evaders embroiled in the HSBC scandal is unacceptable. Shadow chief secretary to the Treasury, Chris Leslie, says Osborne’s silence on the HSBC scandal is telling. He told the Guardian the time had come for the “submarine Chancellor” to surface and disclose what he knows about HSBC and the bank's ex-chairman turned government minister Stephen Green. Leslie stressed a series of unanswered questions remain concerning the Conservative Party’s role in the HSBC scandal. He suggested the public needs to know why there have been so few prosecutions, whether Cameron and Osborne ever broached the subject of tax evasion with Green, and why Green was appointed as a government minister months after the leaked HSBC files were sent to the British government. He also suggested the Tories need to explain why Osborne and the Treasury signed a deal in 2012 with the Swiss, which prevents Britain from actively seeking important financial data in years to come. “In this row over tax evasion David Cameron and George Osborne are now guilty of political evasion,” Leslie said. On Monday, Business Secretary Vince Cable demanded Osborne disclose whether he was sufficiently vigilant when it came to inquiries into HSBC’s disgraced Swiss operation. In a formal apology, printed recently in leading UK newspapers, HSBC’s chief executive Stuart Gulliver conceded society expected more of the banking giant. But he claimed the bank has fundamentally changed how it operates, and has “absolutely no appetite” to conduct business with white collar criminals.